After a lot of search, finally I’ve found a USB/SD video player kit. This kit is priced a bit high at 480Rs(as of 09/2011), which seemed to be loot when I was buying this, but later it is realized how useful is this. 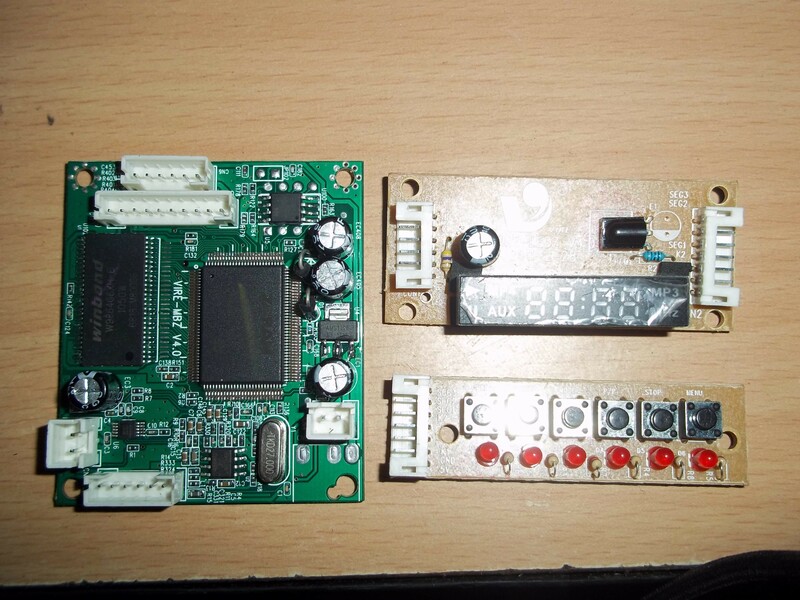 The kit consists of a mainboard, one interface board, one display board and one remote. Interface board: This board consists of HT1628 IC which is a DVD LED Driver IC. 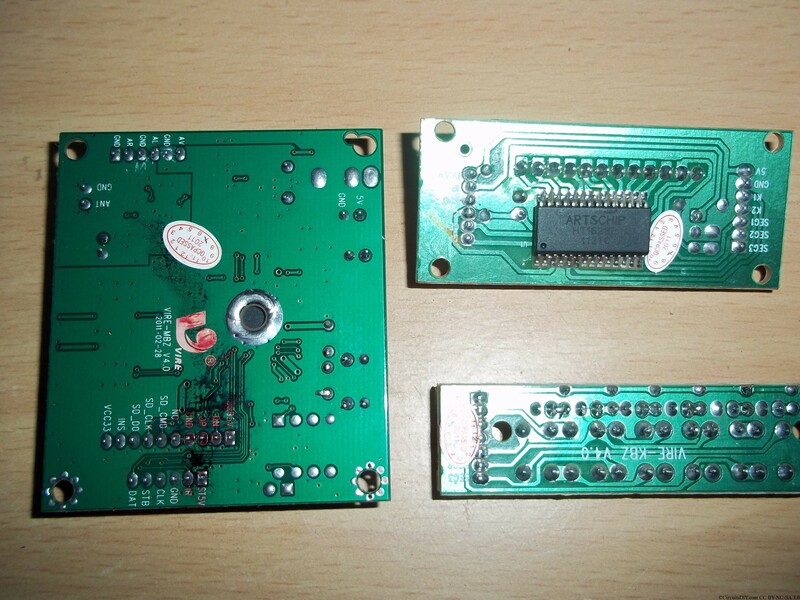 The mainboard connects to this board with a ribbon cable and this board consists of IR sensor and display. Another ribbon cable connects this board with the interface board which has 6 keys and LEDs for the panel. Main Board: The mainboard has two main ICs, one is Zoran ZR36988 DVD processor IC, and another is W9864G RAM. There is an LM1117-3.3 voltage regulator on board which provides 3.3V supply for all the internals. There are a few small ICs like video amplifier, FM receiver, etc. The Zoran ZR36988 IC is a variant of the popular Zoran 36888 IC, which is a DivX certified media player IC. It supports playback of JPEG, MP3, WMA, and MPEG-1/2/4 files and the IC provides HDMI output, true 5.1channel output, etc extraordinary features. Though in the board those features were not implemented and there is only stereo audio and video output enabled for TVs. There is connector for both SD/MMC cards and USB port in the board. I’ve tested this board with my USB pendrive and MP4 and AVI video playback i good enough. The IC is also used in modern DVDs so there would not be any problem in finding the IC if it damages. I guess that IC will cost around 250-300Rs. Zoran based Ok ithing it will not be able to play MKV files can u check it. the board i am interested is called an usb media player advertising boars you can search in net at chinese sites. that board seems to be very good. check if i can order it over net and what will be the final landed cost. September 17th, 2011 at 4:41 amHi, this board is not able to play mkv files, ogg audio, etc special formats. But it plays well 720×480 mp4 files which gives excellent quality in TV. I am unable to find such products online but complete set costs 1500+ online in eBay. First of all thankyou so much for always providing such good information. Regarding this kit, its really helpful for all the hobbyists and small entreprenuers. Hey can you tell me where is it available? Can you courier the same if I transfer the money? September 17th, 2011 at 10:37 amPlease search in every local electronics spares shop for this. I can supply but courier charges will be extra over the right price. Arup good to see peoples like you doing hard for these hobbies. What i think is you could have used a simple SPHE 8202 Based board and used its Ports without connecting the DVD lens. 1 year back i purchased it for 260rs (8202 board)mumbai. i would like to know if you can help me extracting the bin file of the dvd player and modifying it to suit a particular remote as i have a local player but i dont like the remote. i have the second remote and its player for extracting the bin file for the remote key information. kindly help and i would like to know how it can be done and with what software. September 19th, 2011 at 3:42 amI don’t think an USB enabled DVD board will come in 260rs.And about remote, it will be nice if you edit the remote. Just decode existing signals of the actual remote and implement it in the good looking remote. For decoding the R/C signals by USB, you may use USB IR Toy. September 19th, 2011 at 4:49 amThe Board is still available for 320 here. can u help regarding remote. ir toy if its avl there. If you see the above image,it has clear markings for all connections. I have searched in chandni market and madan street it was not found. From my current source in Raiganj, I knew he imported this kit from Delhi. I have stock and you can come here at Gopalganj and buy from me also I can courier you. Does it support 5.1 sound output? And Do u get high clarity pictures when watching a AVI or MP4 movie? October 11th, 2011 at 6:19 amYes the Ic supports 5.1, but in the board it is only limited to 2channes as per PCB limitations. I have found this kit in chandni kolkata costs Rs 450. October 12th, 2011 at 2:40 pmNice find. Do share the shop no, address, etc here to help others. I am looking for something that will simply play a video on a SD chip to a small 7 inch LCD screen with sound. Will this work? October 12th, 2011 at 2:41 pmYes it will play, but it outputs only TV AV. You need a 7? LCD TV for this. October 13th, 2011 at 1:30 pmArup forgive me but i am not a technical person. This appears to be a very good solution and I will need to be able to build multiple units. Is it possible to send an image illustrating power, SD chip, and screen connection? it will just tie everything together. Thank you. October 13th, 2011 at 2:25 pmIt’ll be fine, but I can do that after an week. Now I’ve higher priorities work. Anyway, the images I shared here, is of enough large size that each connection label can be seen clearly. thanks for the replay mr.arup, some more question please, does it mean that i can solder some wires onto the pcb to get 5.1 output? Or is it useless as the ic is not wired to output 5.1? October 13th, 2011 at 2:48 pmThere is no proper datasheet found for this. If a complete datasheet is found, I can suggest you how to modify this. October 14th, 2011 at 2:34 pmNopes. It’s the overview and not a datasheet. I need pin configurations, etc. October 22nd, 2011 at 3:43 pmUse a low gain Booster. hey can u tell me that it sopport remot control ??? November 8th, 2011 at 3:44 pmYes. can i play video files from this kit direcly to my tv? November 15th, 2011 at 5:43 amYes. This is the main feature of this kit. can i connect a car sub woofer with my home amp? what is the diffrence between car woofers watt nd home woofers watt?? any big diffrence… IM CANFUSED \? Yes, you can connect a car subwoofer to home amplifier. Difference between car and home woofer > Car woofers are low power and less efficient compared to same size home woofer, but a car woofer is more sturdy compared to home one. thank you so much..Arnab Sir..
i seen in the market one home that power is 500w .. that operate 4 12inch home speaker nd 2 car subwoofers.. that amp include one extra volume for car subwoofers.. what is the trick behind it..
Don’t fall on their lies, 500W power is too much for audio, 100W RMS will start breaking glasses of your house, specially sub woofers. 10-15 watt is more enough to drive a 12″ woofer, just think about it, 12W RMS means 1Amp average current all the time through the subwoofer coil ! I’d suggest you to learn about the relation of sound output and RMS power, and forget PMPO. hahaha.. thx sir… its too late reply.. but best advice for me.. its means i directly connect a car subwoofer to my home amp??? or connect any circuit with amp??? .. Yes, you can connect it to your existing amplifier, just make sure maximum RMS current through the subwoofer is always lower than it’s max RMS rating. Btw, cheap manufacturers often LIE ! 500w amp price in market 8500₹ …. its too high ..
again thx … sir. .. for guided me. im satisfied ur advice. hello…actually i want to make mini video player ,so does this kit helpful ???? n if yes then how i can get it????? Yes, you can make a mini video player with it, search your local electronics market, but now it’s hard to find. Jemon vire audio board paoa jay… Serokom USB video player kit ekhon chandney market e ppaoa jaabe? Mr. Arup is available, but not always, unfortunately. If you’ve any question, you can ask me, I’ll try my best. Unfortunately these type of MP4 player kits are no longer available, even not available on Aliexpress and Banggood. If I had one, I’d have happily send it to you. wonderfu,l this thread from 2011to 2017. 🙂 . I was searching for a usb board with maximum decoding functionality to the present popular video codecs.